DENVER, CO: It’s likely that diners have begun to avoid Chipotle Mexican Grill. A confirmed case of norovirus at one location and a viral cellphone video of rodents falling from the ceiling at another has soured perception of the brand, according to Credit Suisse analyst Jason West. Credit Suisse’s online sentiment tracker, which measures how consumers feel about a brand, showed the perception of the Chipotle brand fell to near record lows following the two incidents last week. “Not surprisingly, online sentiment plummeted in recent days,” West wrote in a research note Monday. In the past, sales at the Mexican food chain tended to fall as opinions turned negative, he said. Sentiment slipped from a score of 55 on July 17 to negative 11 on July 18, when the norovirus incident was first reported at a Virginia restaurant and the mice were spotted in a Dallas-area Chipotle. These scores improved modestly on July 19 and July 20, reaching 12 and 16, respectively. West anticipates that for the month of July consumer sentiment for Chipotle will average around 35. “By comparison, online sentiment averaged 24 during the month of Dec ’15, the low point following the E. coli and Boston norovirus incidents,” he wrote. The average score was 56 during the second quarter of this year, West said. While West retained his second-quarter same-store sales estimate for the company, he lowered his third- and fourth-quarter forecasts. He now sees Chiptole’s same-store sales falling 2 percent in the third quarter and 3 percent in the fourth quarter. Previously, he expected the brand would see same-store sales rise 7 percent and 4 percent, respectively. In addition, West slashed his price target by $100 to $325. Shares of Chipotle slipped to a 52-week low of $336.52 following West’s note, but have since recovered. On Monday, the stock was down about 1percent, trading around $342. 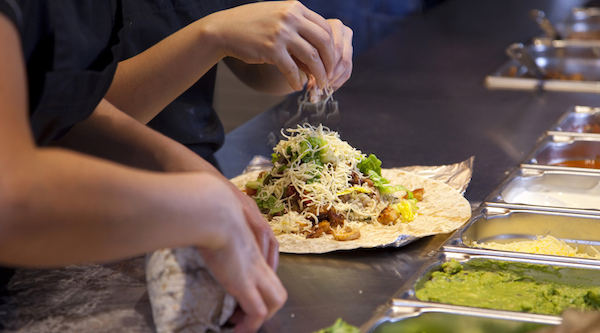 Chipotle reports second-quarter earnings on Tuesday afternoon.